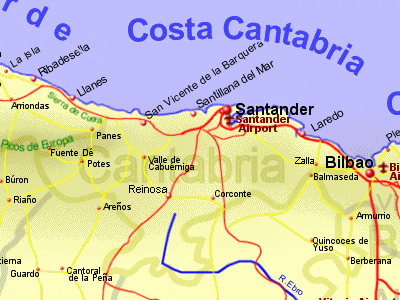 The Spanish region of Cantabria has one province, Santander. On the north coast of Spain, Cantabria has clean sandy beaches among stunning rocky cliffs while inland there are green fields where cattle graze and dramatic mountains (the Cantabrian mountains run along the southern border of the region and become the Picos de Europa to the west. The region is a popular holiday destination for the Spanish during August but has not been hit by the tourism and associated building of some of the popular costas. The weather of course may not be as predictable as further south in Spain but results in an attractive landscape. Santander has a fast train service connecting it to Valladolid and Madrid, and there is also a narrow gauge railway (FEVE) running along the coastline, connecting to Galicia and the French border.